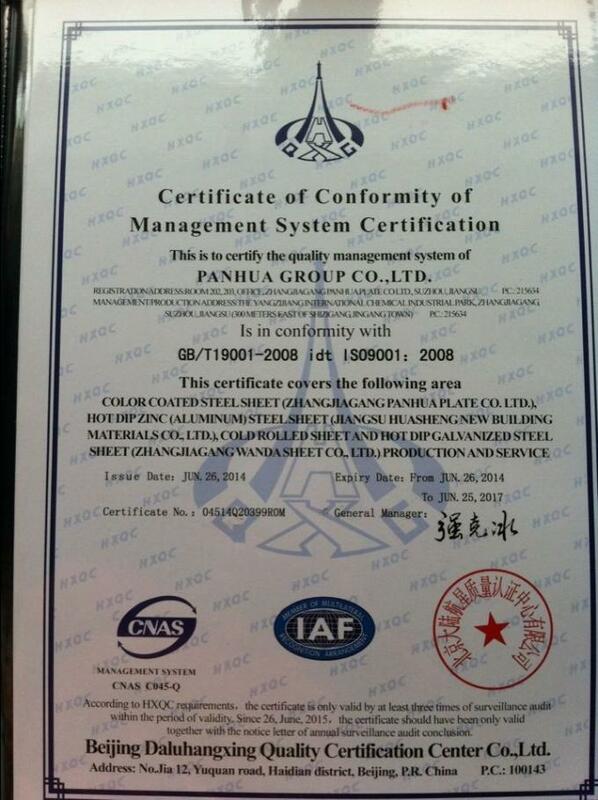 We have two mills, one in Zhangjiagang, Jiangsu, and another is in Chongqing. The added aluminium in galvanizing zinc is conducive. Aluminium is the alloy element to improve performance for normal galvanized product and galvanized alloy product. But for galvalume product, aluminium has greater function, as one important part of coating. 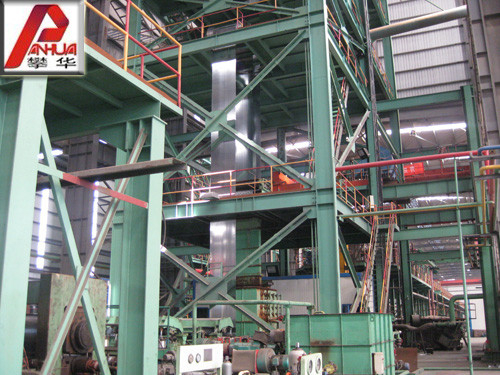 The following only talks about aluminium’s influence on galvanized and galvanized alloy product. a. There are two functions of aluminium during galvanizing, One function is that, aluminium can reduce the reaction between iron and zinc. When striped steel is dipped into galvanizing zinc, aluminium firstly reacts with iron. And it forms a compact film of iron and aluminum compound. 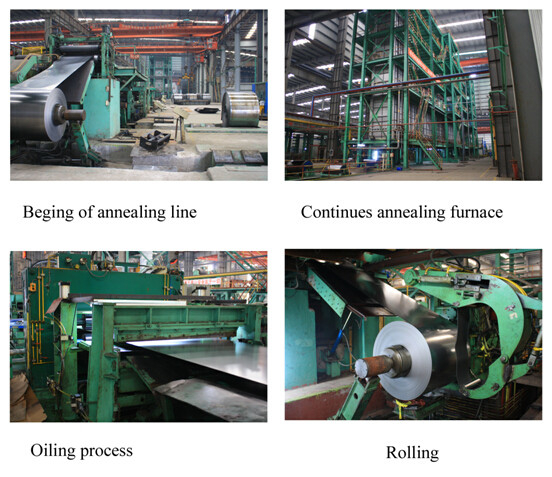 The film can reduce spread of iron, and hinder iron and zinc compound from forming and thickening. The other fuction is that, aluminum helps remove ascent of zinc dross. Since iron is more active than aluminum, aluminum can replace iron from zinc dross of iron and zinc, and form aluminum and zinc compand to remove ascent. b. There are also two functions of aluminium to galvanized product. One function is that, aluminium can improve adhesive force of coating. The iron and aluminium compand as a medium, can closely join base steel and coating together. It helps improve punch forming performance of galvanized steel sheet and prevents from zinc coating falling off when distorted. 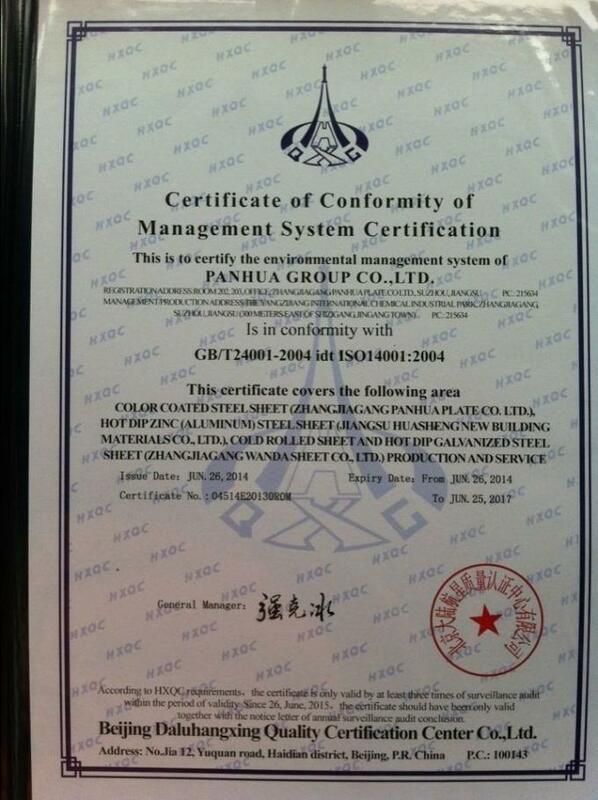 The other function is aluminium can improve homogenization of galvanized steel sheet. Aluminium reduces the influence of reaction between iron and zinc on coating. And it helps uniform thickness of coating, and improves the appearance of galvanized product. B.What is effective aluminum in galvanizing zinc? There are two forms of aluminum in galvanizing zinc. One is free aluminum dissolved in galvanizing zinc. The other is iron, aluminum, and zinc compound (zinc dross) from the reaction between aluminum and iron and zinc compound, which is solid type. The former can be the reactant during galvanizing, and the latter is resultant after reaction. Therefore, the former free aluminum affects the form of coating and ascent of zinc dross.Once the free aluminum takes part in the reaction and forms compound, it will be out of function. Since normal chemical analysis shows the summation of two aluminum types, the result cannot shows the aluminum content, which can continue the reaction during galvanizing. So it is necessary to talk about effective aluminum. The effective aluminum in galvanizing zinc is free aluminum content after decreasing aluminum content in aluminum and zinc compound. The following is the way of testing effective aluminum content in galvanizing zinc. First, analyze total aluminum content and iron content. Sencond, calculate Fe2Al5 content according to the iron content. Then calculate the aluminum content in Fe2Al5. At late, the effective aluminum content is the result after decreasing aluminum content in Fe2Al5 from total aluminum content. a. It affects the appearance of bottom dross. 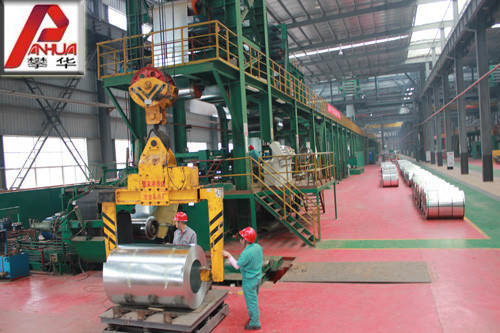 When aluminum content is lower than 0.135%, iron of striped steel and equipment would dissolve into zinc pot, and react with zinc to form FeZn7. The density of FeZn7 is 7.1, and more than that of galvanizing zinc about 6.8. It would deep into the bottom of zinc pot and form bottom dross. But if aluminum content is higher than 0.135%, aluminum would join in the reaction of zinc dross, and form Fe2Al5Znx. Its density is 4.1, lower than that of galvanizing zinc, and forms ascent dross. The ascent dross can be dragged for. 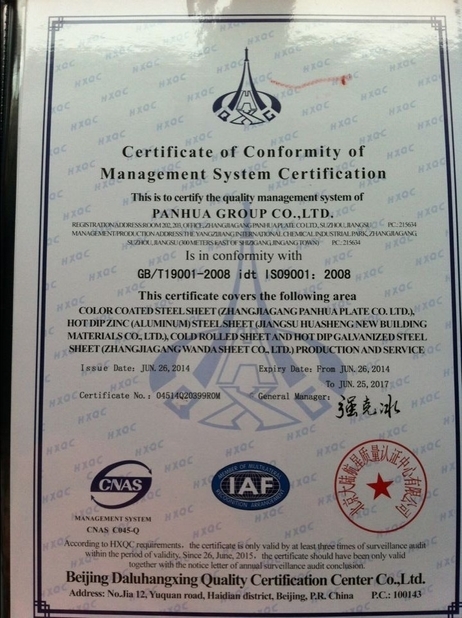 Therefore, more than 0.135% aluminum content is the central part of no bottom dross operation. b. It affects nodules of rolls. As the first effect shows, if aluminum content is low, the dross would be much and fall into the surface of roll when deeping. And with the striped steel, the dross would become nodules on the rolls. Once there are nodules on the rolls, they would be bigger and bigger and cause indentations in production. If stretching cannot eliminate indentations, it would be necessary to stop machine and chang rolls. D.Why does aluminum float upward when zinc and aluminum alloy ingot at high proportion melts? First compared, the melting point of zinc is 419.5 ℃, that of aluminum is 660.4 ℃; the proportion of galvanizing zinc is about 6.8, and that of aluminum liquid is about 2.7. It shows that, aluminum is harder to melt than zinc, and the proportion of aluminum is smaller and easier to float upward. One problem is the melting point of zinc and aluminum alloy. There is no fixed melting point. The alloy melts at some temperature, and it is partial melting during a range of temperature. The melting ends at a lower temperature. The most important problem is aliquation, which is nonuniform zinc and aluminum in liquid. As the melting point of aluminum is higner and its proportion is lower, aluminum float ypward and get together in zinc pot during the range of temperature. The high alumina layer forms in the state of semisolid, and mixs with zinc dross. It is always dragged with zinc dross. 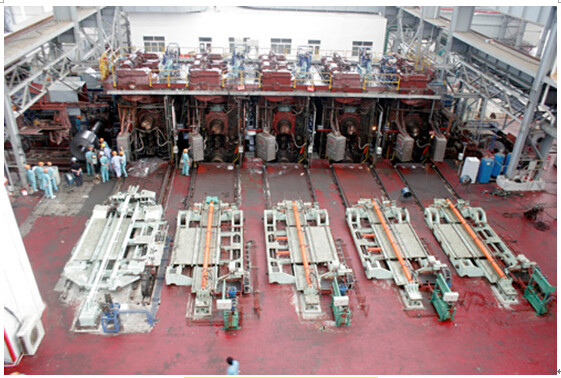 So galvanizing line uses well-mixed and assembled zinc ingot. And when adding zinc, the zinc ingot needs to be melting. If a whole ingot of zinc is putted into galvanizing zinc, local temperature would be too low and it would cause aluminum floating. E.Is it possible to put high alumina ingot under zinc ingot, before adding to zinc pot? It is a good thinking of putting high alumina ingot under zinc ingot in order to melting high alumina and zinc ingot at the bottom of zinc pot. But zinc absorbs a lot of heat as melting, and it can form a low temperature part in zinc pot. Aluminum is more difficult to melt, form viscous liquid of partial melting state, and float up to the surface of galvanizing zinc. At the same time, once zinc ingot and high alumina and zinc ingot add into zinc pot in this way, the zinc ingot can’t control high alumina and zinc ingot. And the high alumina and zinc ingot will float upward. It is undesirable. There are following benefits to press zinc and aluminum alloy onto the bottom of zinc pot by a tool like a basket. a. The inductor aperture of larynx is of high temperature. It is good for zinc and aluminum alloy melting. And it cannot cause liquid of partial melting state. b. The inductor aperture of larynx has the function of mixing, which is affected by high-heat liquid from ring hearth. Once aluminum melt, it is sweept away and avoids mostly floating upward. c. Even if some aluminum floats up, it would mix with galvanizing zinc during the long period of floating. Therefore, it is good to take this method theoretically. And current tests have basically show this. Although every new technique innovation brings some inconvenience, it will become better when we insist and be used to it.